In United States presidential elections, vote pairing usually comes in the form of voters from "safe" states, or non-swing states, voting for third-party candidates, and voters from swing states voting for their second-preference candidate. This form of vote pairing encourages third-party support while minimizing the risk that the more favored major-party candidate will lose electoral votes in the nationwide election (i.e., the "spoiler effect"). In the 2016 United States presidential election, this has usually manifested in the form of supporters in swing states of Libertarian candidate Gary Johnson and Green Party candidate Jill Stein swapping votes with supporters in blue states of Democratic candidate Hillary Clinton. The practice’s legality has been upheld by the Ninth Circuit Court of Appeals, and large numbers of swaps occurred during the 2000 and 2016 elections. Tens of thousands of people have participated in swaps, but I am not aware of any estimates of the cost effectiveness of this practice. This post provides information on the cost effectiveness, based on my work with a vote pairing website, Make Mine Count (MMC). Note: for simplicity, this article talks about how to increase the number of votes to a major party candidate via vote pairing, but it does not consider the value of that increase. In 2016 vote pairing helped the Democrats, but I expect that the effectiveness should be similar if/when the tables are turned and vote pairing benefits Republicans. Rather than talking about “Candidate A” and “Candidate B” I use the names “Clinton” and “Trump”, but this article should not be construed as arguing whether Clinton or Trump was a better candidate. I personally averaged ~10 swing state voters per hour of work, which is 30 times more effective than going door to door. I estimate that MMC increased Hillary Clinton’s chance of winning by about one in 210,000. (For comparison purposes, the average voter has a one in 60 million chance of changing the election outcome.) If other vote pairing websites had similar success rates, in aggregate vote pairing increased Clinton’s chance of winning by one in 15,000. The site overall averaged ~2 swing state voters per hour of work, which is 6 times more effective than going door to door. Vote pairing could plausibly have changed the outcome of the 2000 US presidential election, if pairing had happened in 2000 at the same rate that it happened in 2016. 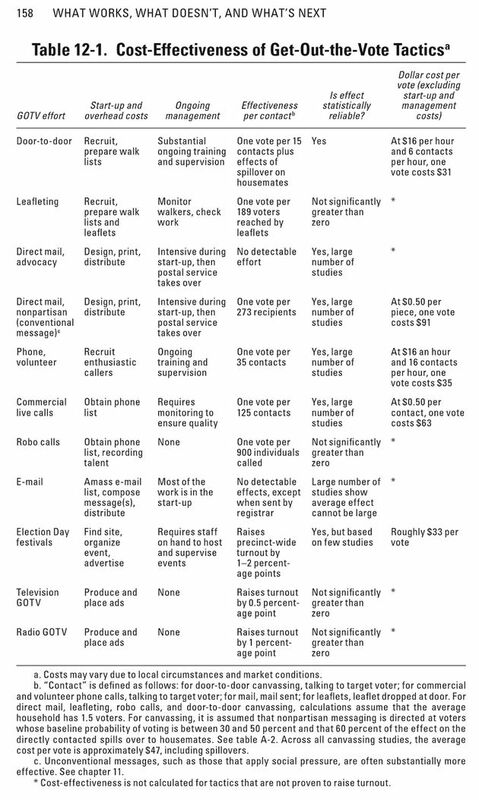 Vote pairing seems to be more cost-effective than making calls, going door to door, or other standard forms of changing election outcomes, provided you are in the very special circumstances which make it effective. In this article, I discuss the benefits that MMC provided, estimates of the cost, estimates of what my counterfactual impact was, and guidance on what we should have done better. I became interested in vote trading several months before the 2016 US presidential election. At the time there were two major vote pairing platforms: Make Mine Count and #NeverTrump.2 I volunteered my time over a couple months to make improvements to the MMC platform. The platform worked as follows: users would sign up, listing their state and candidate preference. Clinton voters in safe states would be paired with third-party voters in swing states, and they would be connected through a secure, private messaging system. After being connected, they would message each other to ensure that both wanted to be paired, after which they would each vote for the other’s candidate. Out of the 2319 people who created an account, 610 were matched and I estimate that a total of 132 votes were cast for Clinton in swing states. Of these, 153 were Clinton voters in swing states and 507 were non-Clinton voters in safe states, making them ineligible to be paired. This leaves 1,659 users who were eligible for a match. Of that 600, 472 sent or received at least one message, and 362 sent and received one message. Presumably some fraction of people who didn’t message each other still went through with the swap (e.g. because they called each other instead of using the messaging feature), but I think this is small and will assume that only these 362 considered having a swap. From a random sampling of 100 anonymized messages, approximately 86% of people who signed up were interested in actually going through with the swap. Most of the 14% who signed up but did not want to use the platform were people who had signed up but forgotten about it, and early voted, making them ineligible to swap. In my sample of 100, there were also 2 people who did not seem to understand the platform (they used it to try to convince their match to vote for Jill Stein instead of swapping) and 1 person who was a Trump troll (promised to swap but reneged). There were also a few who signed up as third-party supporters, but decided to vote for Clinton. A swap needs both parties to be interested, and therefore .862 = 73% of matches resulted in a swap. This leaves us with an estimated 264 legitimate swaps, of which half were votes for Clinton, i.e. 132 votes for Clinton in a swing state were cast as a result of the MMC platform. Because of the nuances of the Electoral College, votes in some states are much more likely to swing the election than others. FiveThirtyEight compiled a “voter power index” (VPI), which compares the relative power of the vote. A VPI of 1 means that a voter in that state has an average chance of swinging the election (~1 in 60 million). A VPI of 2 means that a voter in that state has twice the average chance (~2 in 60 million) etc. The VPI of each state fluctuated throughout the campaign, and for simplicity I used the most recent numbers (calculated November 7, 2016). Obviously, vote pairing is more valuable when the campaign is close and less valuable when it’s a sure thing, so depending on which numbers you use and when you calculated those numbers, you will get different estimated impacts. I also assumed independence (i.e. one voter with a VPI of 2 is as good as two voters with a VPI of 1) – this is slightly untrue, but I don’t think it makes a big difference at the scales I am talking about in this document. The total impact was 4.7e-6 ~= one in 210,000. Another website (Trump Traders) advertised 45,000 users but was only two-thirds as effective on a per-user basis as MMC.4 If they had success rates similar to ours, they would’ve influenced Clinton’s chances by about one in 16,000.5 I was not able to find numbers for #NeverTrump, but it seems plausible that all the sites combined increased Clinton’s odds by about one in 15,000. Steve, the primary developer of MMC, estimates that he spent 40 hours writing code and an additional 40 hours thinking about the site. Steve spent $310 for hosting and miscellaneous costs. I spent seven hours of my time working on the MMC site. The total cost was 50-90 hours of labor plus $1,310 in hard costs. It seems unlikely that very many people would have paired with someone on their own, without a vote pairing site existing. Therefore, the counterfactual is mostly about what fraction of these people would have otherwise used a different site. Of the ~800 unmatched Clinton voters we emailed recommending that they sign up for TT, 75 did. They would not have signed up for TT if they had already signed up for another site, so at least 10% of the votes were counterfactually valid. Of the 100 users I examined, only one said that they had signed up for another site and were therefore not going through with the swap. This gives an upper bound of 99%. My guess is that it’s more towards the upper side (10% is a very high click through rate for any email). One general problem I found is that people wanted to create their own vote pairing websites instead of working together – this is obviously inefficient due to the network effects required for vote pairing to work, but I wasn’t able to make that argument successfully. Created Facebook integration for the site, and some general site cleanliness stuff (e.g. the social media “share” buttons did not work when I first started). 36 votes were using Facebook integration, and Facebook was the vast majority of our user traffic (70%). I will give myself 25% of the 132 MMC Clinton votes for this (= 33 Clinton swing state votes). Coordinated referring voters from MMC to TT. It seems extremely unlikely to me that anyone else would’ve done this if I had not, and therefore I will give myself all of the 75 referred people (= 37 Clinton swing state votes [TT paired 2 Clinton voters with every third-party voter]). Note that almost all of this impact is due to the fact that I was willing to join someone else’s project instead of starting my own. Starting a new vote pairing website is inherently much less cost-effective because of the setup costs and time and the fact that it is splitting apart the voter pool, making it more difficult for people to be matched. As an example of what a small amount of highly targeted advertising can do, Linchuan Zhang posted on his Facebook that Trump Traders needed more Clinton voters, and that one post resulted in 24 TT accounts (= 12 Clinton swing state votes). It probably took him less than 15 minutes to write this post, which means that it was about 100 times as productive as going door-to-door. There was a ton of unnecessary and duplicated work because so many people decided to create their own products instead of working together. I’m not sure how to solve this. We decided to wait until close to the election in order to match people up so that we could accurately determine which states were “in play”. This resulted in a lot of people forgetting that they had signed up (or assuming the site didn’t work). We should have had more frequent touch points, or matched people sooner. Many people seem to be concerned about fraud (i.e. someone would promise to trade with them but would secretly vote for Trump). This isn’t a very legitimate concern – the entire premise of vote pairing is that Clinton votes in blue states are worthless, so Trump advocates would have nothing to gain by doing this7 – but I would guess that it turned a significant number of people off the idea. We should have done a better job of countering this claim. I did not invest very much time into promoting the site, largely because I was unclear about how effective it would be. I think I probably could have gotten on local news or other media if I had really tried. Fortunately, now that this document exists (and if it’s shared widely), people working on vote pairing in 2020 will better understand its effectiveness. In the 2000 presidential election, Gore lost Florida by 537 votes. More than 5000 votes were swapped in Florida alone in the 2016 election,8 indicating that the outcome of the 2000 presidential election could reasonably have been changed if vote pairing happened in 2000 at the same rate that it happened in 2016. Vote pairing seems to “punch above its weight” in terms of effectiveness, but will only be useful when there are large numbers of people who want to vote for a third-party candidate. Furthermore, creating a new vote pairing site from scratch is likely to be much less effective than the numbers listed here, and is possibly less effective than traditional GOTV activities. If the 2020 election is as high-stakes as the 2016 one, and I am similarly positioned to how I was in 2016, I will very likely work on voter pairing again. I would like to thank Steve Hull for creating MMC, open-sourcing it and sharing anonymized data; Linchuan Zhang for talking about the election and vote pairing with me; the Trump Traders team for accepting referred users and sharing conversion rates; Rob Wiblin, Gina Stuessy and Linchuan Zhang for reading drafts of this article; and Rob Wiblin for the general motivation for becoming involved in the campaign. The observant reader will note that some of these states have a VPI less than 1, which indicates that they probably should not have been swapped. We used Princeton Election Consortium data to determine swing states which, in retrospect, was a bad idea. The inaccuracy of these forecasts led to PEC’s creator eating a bug on live TV. See this table from Get Out The Vote. I personally was able to contact many fewer people per hour than GOTV claims is average when going door to door or calling people (meaning that vote pairing was even more cost-effective in comparison). Thanks for the write up. I think you make a compelling case that this is more effective than canvassing, which can be over 1000 dollars for votes at the margin in a competitive election like 2016. I do think there are a few ways your estimate may be an overestimate though. Of those who claimed they would follow through with vote trading, some may not have. You mention that there wouldn't have been much value to defecting. However, much of the value of a vote for individual comes from tribal loyalties rather than affecting the outcome. That's why turnout is higher in safe presidential states in a presidential election than midterm elections, even when the midterm election is competitive. Some individuals may still have defected because of this. Secondly, many of the 3rd party folks who made the trade could have voted for Clinton anyway. People who sign up for these sites are necessarily strategic thinkers. If they wanted more total votes for Stein/Johnson, but recognized that a vote for Clinton was more important in a swing state, they might have signed up for the site to gain the Stein/Johnson voter, but planned to vote for Clinton even if they didn't get a match. Additionally, even if they were acting in good faith when they signed up, they may have changed their mind as the election approached. 3rd parties are historically over estimated in polling compared to the election results, and 2016 was no exception: http://www.realclearpolitics.com/epolls/2016/president/us/general_election_trump_vs_clinton_vs_johnson_vs_stein-5952.html. I don't think these problems are enough to reduce the value by an order of magnitude, but it is worth keeping in mind. Additionally, while vote trading may be high EV now, I am skeptical that it is easy to scale. It's even more difficult to apply outside of presidential elections, so, unlike other potential political interventions, it will mostly be confined to every 4 years in one race. Furthermore, the individuals who signed up now may be lower cost to acquire than additional potential third party traders. They are likely substantially more strategic than the full population of 3rd party voters; in many years, the full population isn't that large to begin with. The cost per additional vote may be larger than your current estimates. Nevertheless, I agree that right now it's probably more valuable than traditional canvassing and I'm glad people are putting resources into it. Yeah, those are fair points. I would say that some EA's seem to over-estimate the amount of time people put into choosing a candidate. There are probably a few people who are calculating the Nash equilibrium and deciding to defect after agreeing to trade, but most people just do the honest thing because they are honest. I have one concern about this which might reduce estimates of its impact. Perhaps I'm not really understanding it, and perhaps you can allay my concerns. First, that this is a good thing to do assumes that you have a good certainty about which candidate/party is going to make the world a better place, which is pretty hard to do. But if we grant that we did indeed pick the best candidate, there doesn't seem to be anything stopping the other side from doing the same thing. I wonder if reinforcing the norm of vote swapping just leads us to the zero sum game where supporters of candidate A are vote swapping as much as supporters of candidate B. So on the margin, engaging in vote swapping seems obviously good, but at a system level, promoting vote swapping seems less obviously good. I generally like arguments from humility, but I think you're overstating the difficulty of choosing the better candidate. E.g. in 2016 only one candidate had any sort of policy at all about farmed animals, so it didn't require a very extensive policy analysis to figure out who is preferable. The same is true for other EA focus areas. I agree. I do not think that promoting vote pairing irrespective of the candidates is a very useful thing to do. 2016 only one candidate had any sort of policy at all about farmed animals, so it didn't require a very extensive policy analysis to figure out who is preferable. Beware of unintended consequences, though. The path from "Nice things are written about X on a candidate's promotional materials" to "Overall, X improved" is a very circuitous one in human politics. The same is true for other EA focus areas. A lot of people in EA seem to assume, without a thorough argument, that direct support for certain political tribes is good for all EA causes. I would like to see some effort put into something like a quasi realistic simulation of human political processes to back up claims like this. (Not that I am demanding specific evidence before I will believe these claims - just that it would be a good idea). Real-world human politicking seems to be full of crucial considerations. In order to think vote trading is a good idea, you have to think that, with some reasonable amount of work, you can predict the better candidate at a rate which outperforms chance. Humility is important, but there's a difference between "politics is hard to predict perfectly" and "politics is impossible predict at all". there's a difference between "politics is hard to predict perfectly" and "politics is impossible predict at all". I think there's a lot of improvement to be had in the area of "refining which direction we are pushing in". Was there ever a well-prosecuted debate about whether EA should support Clinton over Trump, or did we just sort of stumble into it because the correct side is so obvious? Thanks for writing this! At the time that I wanted to find a vote-swapping site, there were so many that had just popped up that I wasn't sure which to go with, and none of them seemed to work well. Getting organized well in advance seems like a good way to go for next time. "On August 6, 2007, the Ninth Circuit Court of Appeals ruled on a case, Porter v. Bowen, stemming from the California Attorney General's shutdown of voteswap2000.com. Vote-swapping, it said, is protected by the First Amendment, which state election laws can't supersede, and it is fundamentally different from buying or selling votes. Furthermore, vote pairing agreements are not legally binding. However, it is unclear if other courts would agree should this arise again, and in recent years, the Ninth Circuit Court of Appeals has had the most decision reversals of any United States court of appeals." So, if vote pairing becomes more popular in the future, its legality isn't certain. How effective do you think investment would have been at the margin there was at the end of October 2016? I'm surprised to see only about ~$1K of advertising put into it, for example, but maybe there were steep returns by that point? Yeah, good question. AdWords for terms like "vote swap" had a CPA of 2 to 3 dollars, but generic things like "stop Donald Trump" were ineffective. I don't believe we maxed out spend on the former category, and I think that the latter category probably would've been more effective if we had focused on conversion better. In summary: we probably should have put more advertising dollars and effort into the project. Another approach is to work to advance voting methods that are robust to vote splitting. Vote splitting is, after all, what we're talking about here. In this context, the focus is on vote splitting within swing states. Vote splitting is when multiple candidates have a similar ideology and because of the single selection voters are required to provide under plurality voting, the vote divides between those candidates. This creates an advantage for candidates who don't have a similar competitor and randomness when both leading candidates have a similar competitor. The most straightforward way this is being addressed currently is through an inter-state compact called the national popular vote plan (http://www.nationalpopularvote.com/). The issue with that is that at the end of the day there can still be vote splitting at the national level because the system still uses plurality (choose one) voting. An alternative that would fix that is approval voting (https://www.electology.org/approval-voting). This allows the voter to choose as many candidates as they want and can use current ballots and machines. It is highly robust to vote splitting and allows the voter to support their favorite candidate no matter what, even if that candidate isn't' viable. The other advantage of this method is that it is precinct summable, which means you can take state totals and then use those totals to get national totals. You don't need the raw ballot data to be collected in a central location. It also allows for hybrid counting for if certain areas still use plurality voting. Because of these properties, this would be an excellent candidate for an improved national popular vote plan. As a note, there was no spoiler effect in the 2016 election. As noted in other comments, the vote pairing approach requires trust. Also, an alternative candidate method, instant runoff voting/ ranked choice voting does not let you vote your favorite every time and is not precinct summable. One of the challenges of approval voting is its current lack of use in government elections, which would mean acquiring a track record in localities and states before use at the national level. For disclosure, I'm the executive director of The Center for Election Science, which promotes approval voting.